Hurrricanes have a tendency to alter the conditions of the ocean both above and below the surface. 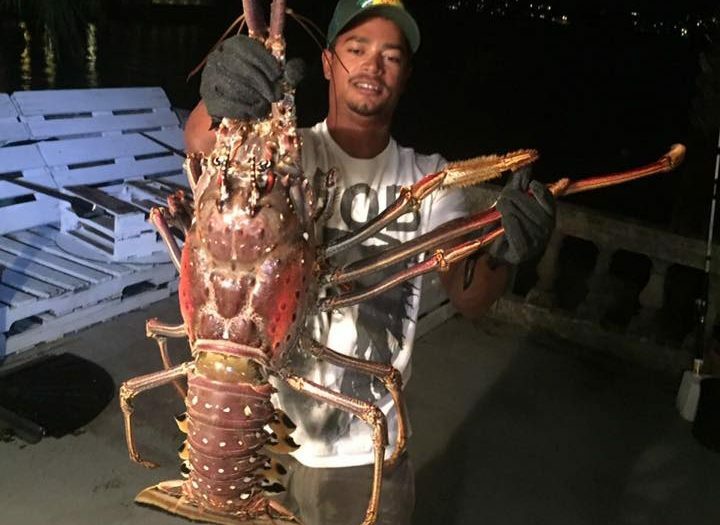 It seems Hurricane Nicole managed to dislodge a gargantuan 14-pound lobster off the coast of Bermuda that found itself exposed and snagged by a fisherman’s hook. Tristin Loescher shared on the Facebook page of Santcuary Marine Bermuda video and photos of his catch, which he released. Loescher hooked the giant lobster while fishing grey snapper. Loescher said he contemplated what to do with the massive crustacean. He couldn’t take it to an aquarium because it had already closed. And keeping the lobster would not likely yield very good meat because the animal was so old. Normally lobster is between 1 to 3 pounds. So Loescher freed the creature, and just to make sure it survived the re-entry he swam with it for about a half hour until it regained strength.